A while back I put this shelf arrangement up on this small wall between the kitchen and familyroom. I loved it, however every time my DH came in from outside and rounded the corner to the kitchen, he hit it with his shoulder. It's very shallow, but since he hasn't gotten use to it being there, I finally decided it should come down. 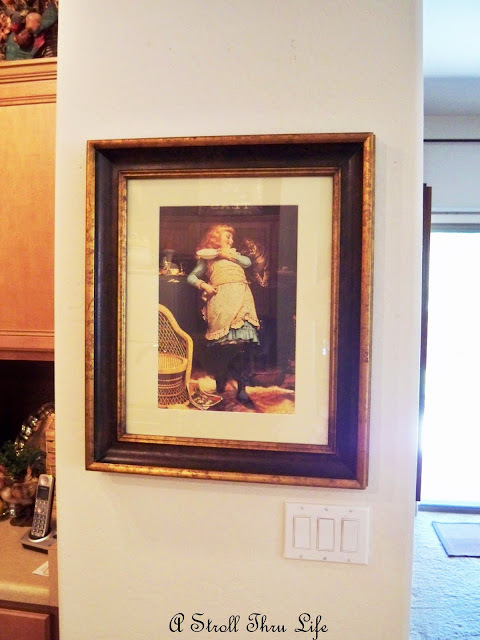 This is one of a pair of paintings that I had hanging in the hall. I decided simple was best, and DH can't hit it. Love the frame on this picture and the little girl is just tooooo cute. She has a bowl of milk for the kitty, and I think she's teasing him. This is the other one that is still hanging in the hall. Such a cute little girl reading to her dog. Hard to get a good picture with all the sun shining in all the windows. Makes quite the glare. For now I am liking the change. 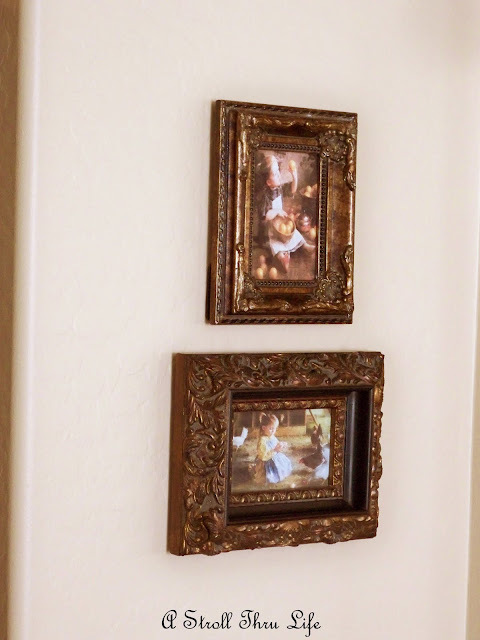 I loved the pictures I had in the shelf arrangement, and decided that these two of the little girls on the farm would work on this small section of wall in the dining area. I was trying to avoid the glare here also, one is inspecting oranges and the other is gathering eggs. Such cuties. By the way - I love North Carolina, having spent several weeks there earlier this year. I Love what you did Marty! I had to do a similar thing in my powder room with a shallow shelf that my guys kept bumping! It's so nice to rearrange the inventory now and then. I ""LOVE"" your taste in pictures!!! Menfolk are such bulls in a china shop, aren't they?! Your new pic arrangements are perfect! Sometimes that is all it takes is to rotate a few things around to give it a fresh look...and help with the economy crunch too, lol! Your home is SO wonderful, Marty! I love your pretty picture and I think you're right - she must be teasing that kitty! Hi Marty, I always love seeing what you are doing in your nest. Beautiful art work-love paintings of little girls. I have one that isn't hung that is of two sisters having a tea party. I also have a plate that has two sisters on it. 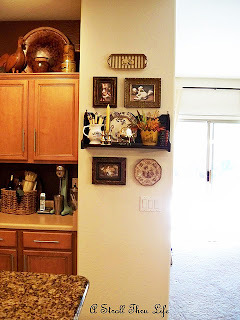 Hi Marty - I like the pre and post hubby wall layout ... now if you want him to have a project - you could have him re-do the wall and make a recessed set of shelves for you ... hahahaha - just kidding ... keep up the creative design ... it's always nice to keep the husband guessing . . . what will she do next. Love your pictures and I know all about moving things so some certain someone will quit hitting things. I loved your little shelf in the kitchen but do understand that sometimes we have to face reality. I had one too in my kitchen and I was the one who actually ran into it all the time...sure was cute though. By the way, I did a little snooping and saw all your gorgeous clocks on your wall. Have you posted about those before? If so, I must have missed it!! I collect clocks too and would be very interested in your story about them! I like what you have done with this spot, Marty! The picture is too cute! Marty, YOu have a creative talent for making pretty vignettes! I see that you are up to it again! I know exactly what you mean about that shelf Marty, I have one that I've now screwed firmly to the wall as I keep catching it! Love the changes - such adorable pictures. I am always decorating around the hubby. That's why I have no shelves or pictures or anything in my hallway. I love that picture with the dog and girl. So sweet! I think it is always good to change things around, it gives a room a new look without spending any money. The last thing you wanted was for your DH to knock things off the shelf! 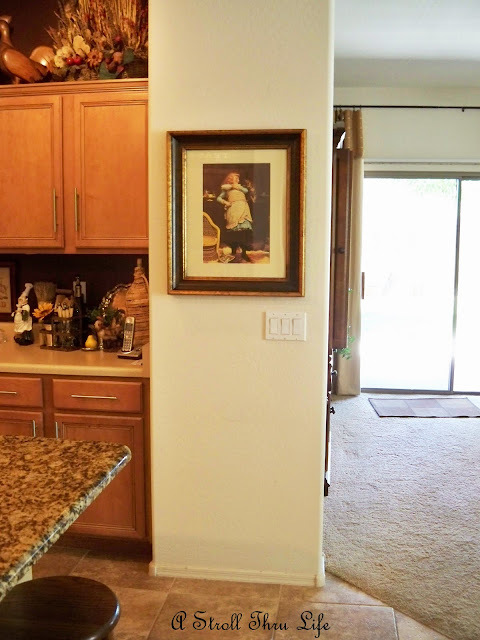 The pictures look great in their "new" homes! I really like the changes! Looks great! Good choice Marty! I love making changes like that, just to make it feel like you got something new! 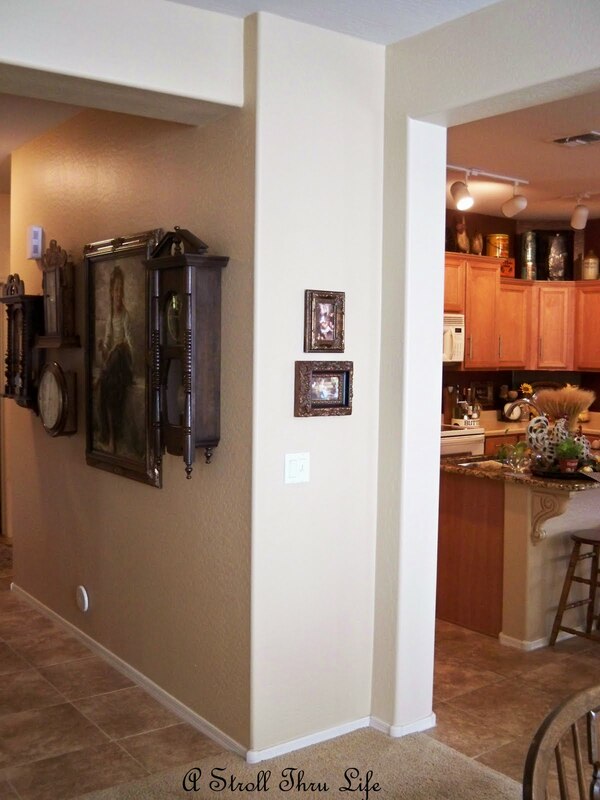 It is nice to use what you have and although I love the arrangement on the wall -- the other makes more sense -- great job! I loved the shelf with all of the goodies on it but I can understand totally about your husband hitting it every time. The pictures are stunning and the one you placed there also looks wonderful!! I have menfolk that do the same thing. 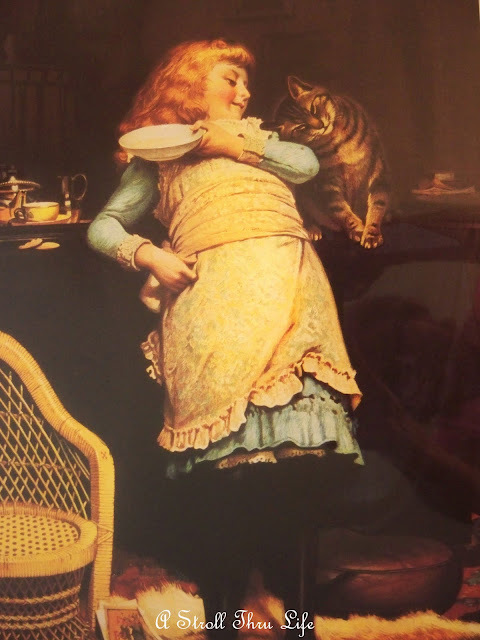 But I love the picture with the girl and kitty. Very sweet and just the right size for that spot. I like all of them, but I particularly like the pair with the girls, both the one hanging in place of the shelf and the other one. That's something like I would like here. Nice changes Marty! I love the frames on the smaller pictures! They are really pretty! Every time I visit you, Marty, and see your loving home, I have to smile. My home and my clothing style are the same. I can NEVER quite accomplish the polished look. No matter...I just visit you! I loved how it was Marty and I think it looks great now too! You do have that touch girl! Can't wait to see you in July! Just wish I knew when but I am trying to make a plan around the time the baby arrives! I really like your art. 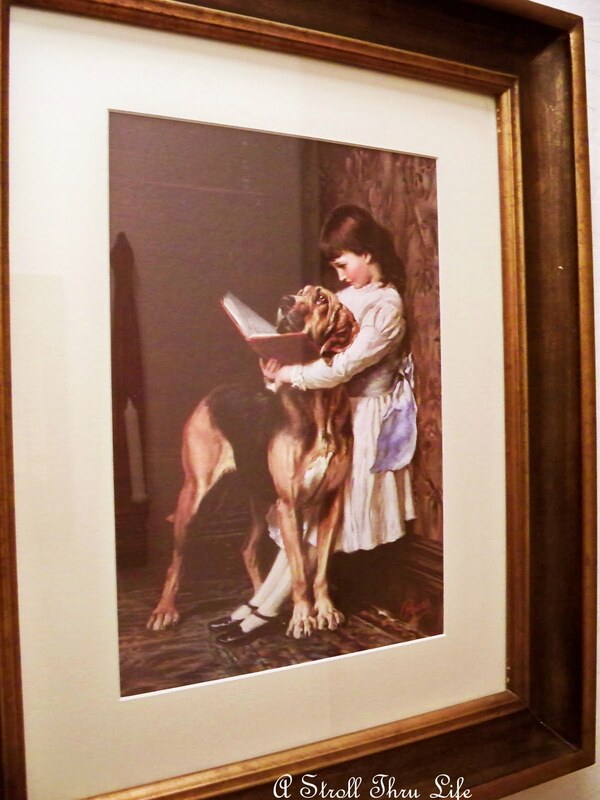 Good choices, and good placement in your home :D I am partial to the little girl reading to the dog. Too, too cute! Hey Marty, Thank you so much for joining my party this week. The little girl print is adorable and I love your collection of clocks on the wall. Have a great weekend.